Alex George (pictured) recently won a compact main feature at Shady Bowl. DeGRAFF – This weekend, Shady Bowl Speedway will be running two days of racing – Saturday and Sunday. On Saturday, the Late Models, Modifieds, Street Stocks, Tuners, Compacts and Dwarfs will be on hand. There will be qualifying and heats in all divisions. Features will be run for only the Tuners, Compacts and Dwarfs. The pit gate will open at 2 p.m, grandstands at 4 p.m. and racing will start at 7 p.m.
On Sunday, there will be a 72-lap Bobby Korn feature for Late Models with $172 going to the winner. The modifieds will run a 50-lap Roger Winget Classic feature with $2,121 going to the winner. There is also a $200 to start for Modifieds in the feature. 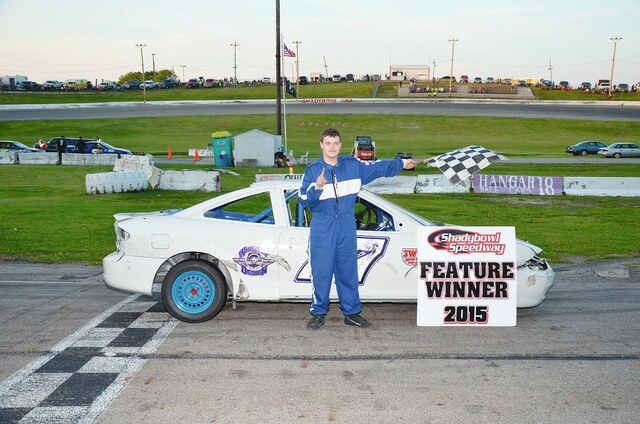 A 30-lap Street Stock feature with the winner collecting $800 will also be held. There will also be features for the Compacts, Tuners and Dwarfs. Pits will open at noon, grandstand at 1 p.m. and racing will be held at 3 p.m.